Polymerization reactions are widely investigated and have led to high value, high performance engineered materials that are in our homes, automobiles and even our bodies. For these polymers, a thorough understanding of polymerization reactions and control of all reaction variables is crucial to producing a material that meets the end-use requirements and specifications. Polymers are macromolecules that consist of smaller repeating monomeric subsegments that are linked together to form chains. Polymers that exist in nature, such as polypeptides and polysaccharides, are critical components of living organisms. Synthetic polymers, such as nylon and polyurethane, have transformed how we manufacture and use commercial products. 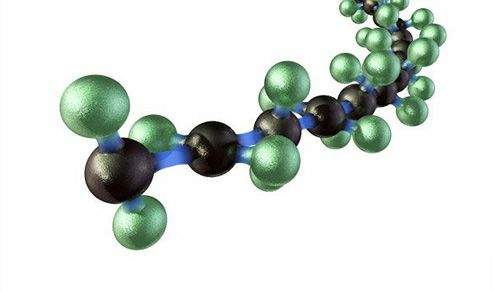 These latter polymers are typically formed by adding monomer segments together via free radical addition processes or through linking the segments together by condensation reactions that produce the polymer along with water or another small molecule. What is Important to Measure for Polymerization Reactions? Whether a polymerization proceeds via addition as a chain reaction or condensation in a step reaction, it is essential to fully understand the chemistry in order to advance research and/or quickly bring new polymers to market. This understanding involves factors including the kinetics of the reaction, monomer conversion rates and reactivity ratios, the relationship and influence of reaction parameters on the molecular weight and distribution, a thorough understanding of polymerization mechanism in initiation, propagation and termination phases and ensuring that the overall polymer structure meets the target application need. In more complex polymerizations such as copolymer or multi-polymer, measuring the individual reaction rates of the different monomers allows researchers to both tune and ensure the physical properties of the final product. Understanding critical polymer reaction parameters can lead to precise control of multi-step polymerizations, real-time residual monomer measurements, and ultimately improved end-use polymer properties. Well-regulated polymerization reactions yield molecules that are well-characterized with respect to composition, molecular weight, molecular weight distribution, structural and physical properties. A thorough understanding of these elements ensure that the synthesized polymer is “fit-for-purpose” in its intended use. To achieve this, it is necessary to understand and carefully control the many chemical and reaction parameters associated with the synthetic process. Infrared spectroscopy has proven to be highly valuable for meeting this challenge. 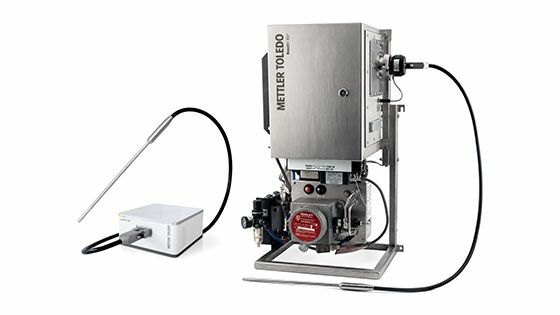 Real-time, in situ FTIR measurement has proven particularly valuable to provide insight into key kinetic, mechanistic and chemical structure information, while eliminating the difficulties associated with off line measurements of polymerizations reactions. Over the past three decades, the investigation of polymerization reactions from the lab through scale-up to production has been one of the most prolific and valued uses for in situ FTIR technology. Track individual monomer conversion rates and overall polymer composition in copolymer and multicomponent polymerizations . Measure residual monomer levels and ensure that they meet product and regulatory requirements. Adjust charge ratios and other reaction variables to minimize the amounts present. Schultz, A. et al., Virginia Tech, “Living anionic polymerization of 4‐diphenylphosphino styrene for ABC triblock copolymers”, Polymers International, vol. 66 issue 1, 52-58, (2017). 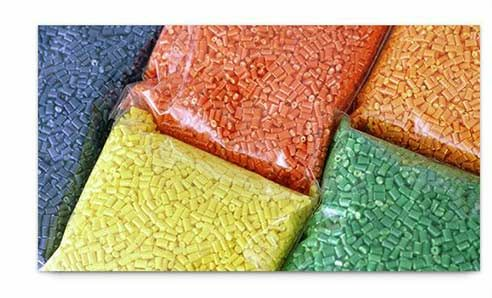 Anionic polymerization is a widely used chain growth method for producing thermoplastic elastomers and many hundred thousand tons of material is made every year using this process. In this article, the scientists report the development of a new class of phosphorus-containing styrenic ABC triblock copolymers. ABC triblock copolymers are formed by linking three different monomers and in this case, those monomers are styrene (S), isoprene (I) and 4-diphenylphosphino styrene (DPPS). The scientists report that sequential addition of these monomers via anionic polymerization yields a high-performance polymer that can be fine-tuned with regard to molecular weights and molecular weight uniformity. By tracking IR peaks for the individual propagating monomers (S, 908cm−1; I, 912cm−1; DPPS, 918cm−1) with ReactIR, they confirmed the living synthesis of the poly(S-b-I-b-DPPS) and were able to gain insight into the kinetics of each propagation step. Understanding kinetics and adjusting fine-tuning reaction variables is critical to produce a material with targeted performance. ReactIR is Ready. Are You? H. Deng, Z. Shen, L. Li, H., J. Chen, “Real-Time Monitoring of Ring-Opening Polymerization of Tetrahydrofuran via In Situ Fourier Transform Infrared Spectroscopy”, J. Appl. Polym. Sci (2014) 40503. Polytetrahydrofuran is a widely used industrial polymer that is formed via a cationic ring-opening reaction. The reaction tends to proceed rapidly with a number of factors influencing yield and molecular weight of the final product. For this reason, it is important to understand the kinetics and thermodynamics of the reaction. The scientists involved in this study decided to investigate this important ring-opening reaction with ReactIR technology. They pointed out that this polymerization reaction had been studied previously by a number of off-line analytical methods including gravimetric analysis, NMR, GC, UV-Vis and dilatometry. As the reaction proceeds, the increasing viscosity makes off-line sampling increasingly problematic and therefore these earlier investigations focused on initial stages of the polymerization reaction. They found that using in situ, real-time analysis is a better means to study this polymerization since it improves measurement accuracy, eliminates the time and difficulty associated with off-line sampling and most importantly, gives a more complete understanding of the reaction kinetics and thermodynamics. For this polymerization study, they recorded the reaction process through all stages and studied the effect of variables such as temperature and initiator concentration on the reaction kinetics. Permits simultaneous tracking of both THF monomer and PTHF polymer – no need for separate methods of analysis. Monitors reaction throughout entire polymerization. Offline grab-sample analysis is limited to investigating early stages due to increasing viscosity and the difficulty associated with sample removal. 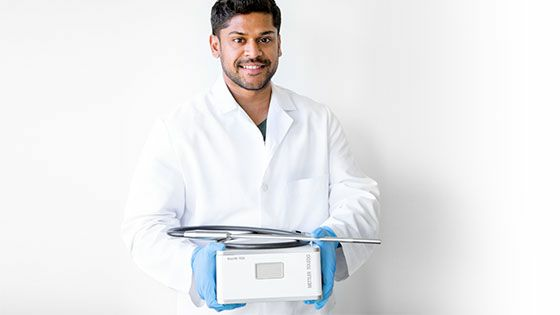 Enables more accurate measurement of residual monomer throughout latter stages of polymerization reaction because of the difficulty of getting all sample out of sample extractor for off-line analysis. Provides far more analysis data points over the course of the polymerization, yielding more representative measurements and accurate kinetics and thermodynamics calculations. Shows that the reaction kinetics are first order at lower temperatures and at early stages at higher temperatures. Shows that at later stages of reaction at higher temperature there is significant deviation to first order kinetics, resulting in molecular weight distribution variation of PTHF polymer. Dr. Long describes how in situ FTIR impacted polymer synthesis research. The technology allowed his group to determine real-time kinetics, reactivity ratios, and activation energies on the polymerizations reactions studied. This presentation highlights the in situ FTIR monitoring of various chain growth polymerization processes for the determination of reactivity ratios during copolymerization. 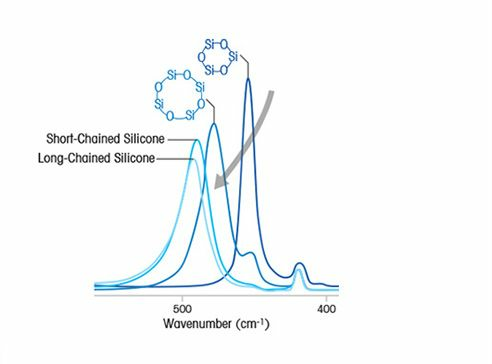 FTIR is well suited for chain growth addition involving olefinic monomers. Plus, the addition of various nucleophiles using click reactions with a focus on the Michael addition reaction is described. Spectroscopy during peroxide decomposition also permits the determination of half-life times during nitroxide mediated polymerization. 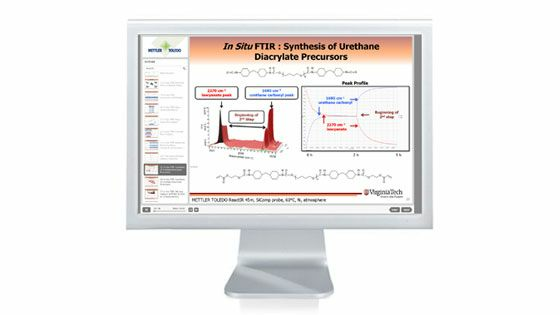 In addition to chain growth polymerizations, in situ FTR is well suited for the monitoring of isocyanate composition in the formation of urethanes. In Situ FTIR Spectroscopy provides continuous monitoring of key polymerization species (monomers and polymers), and provides valuable information on polymerization reaction kinetics. With real-time, in situ ReactIR, the individual monomers used in co- and ter-polymerization reactions can be tracked in real-time enabling decisions about the reaction to be made immediately throughout the experiment. Minimize the need for labor-intensive offline analyses. e,g., gravimetric measurements, gel phase chromatography, NMR. Process Development and Scale-up workstations provide thermodynamic data in real time, the ability to investigate the impact of changing conditions on heat and mass transfer and support studies related to concentrations, temperature, or kinetics.. Reaction calorimeters allow researchers to measure heat generated by a polymerization reaction and to control the reaction based on heat output. 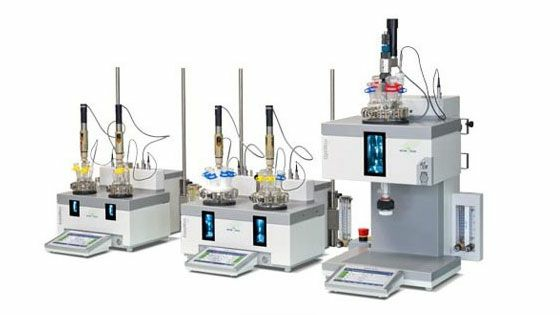 The control of the relevant parameters including additions can be automated and pre-programmed, so experiments can be safely run while recording all polymerization reaction parameters, 24 hours a day. The individual steps of the process of the polymerization reaction together with the experimental data are continuously recorded and stored securely making them available for evaluation and interpretation. Due to the safe, highly accurate, and precise measurement and control, the number of experiments required is reduced making scale-up efficient.. In polymerization reactions, the impact of process parameters on droplet size are important factors to consider. Traditionally, this has been estimated using offline methods. However, such an approach can be can be difficult and unsafe. 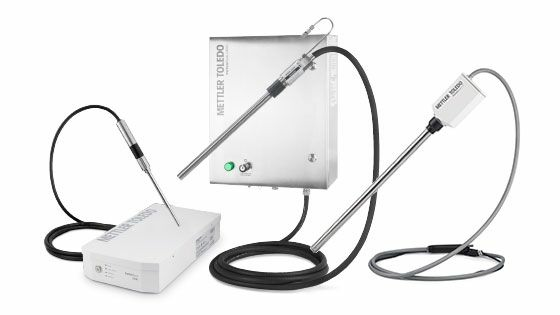 Inline monitoring with ParticleTrack and ParticleView allow droplets to be monitored in real time and enable operators to act decisively in the plant environment to ensure product specifications are met. Key kinetic mechanisms such as coalescence and breakage can be quantified in real time enabling users to understand the impact of changing process parameters and ensure batch-to-batch repeatability. Block Copolymer Properties, Self-assembly Behavior, S. J. Byard, M. Williams, B. E. McKenzie, A. Blanazs, S. P. Armes, Macromolecules 2017, 50, 1482–1493. Online Monitoring of Polymerizations, J. Haven, T. Junkers, Eur. J. Org.Chem. 2017, 6474-6482. ABC Triblock Copolymers, A. Schultz, M. Chen, G. Fahs, R. Moore, T. Long, Polym. Int 2017 66, 52-58. High Cis-1,4 Isoprene Polymerization, A. Schultz, S. Bobade, P. Scott, T. Long, Macromol. Chem. Phys. 2018, 219, 1700201. Cationic Polymerization Of Isobutylene, S. Zhu, K. Wang, Y. Lu. ACS Omega, 2018 3(2), 2033-2039. Ethylene Polymerization, On-Line Particle Growth Monitoring, and in Situ Nanocomposite Formation Using Catalysts Supported on Arylsulfonic Acid-Modified Boehmites, Rainer Xalter, Frédéric Pelascini, and Rolf Mülhaupt, 2008, 10.1021/ma702623e. Online Monitoring of Polyolefin Particle Growth in Catalytic Olefin Slurry Polymerization by Means of Lasentec Focused Beam Reflectance Measurement (FBRM) and Video Microscopy (PVM) Probes, Rainer Xalter, Rolf Mu ¨lhaupt, Macromol. React. Eng. 2010, 4, 25–39, DOI: 10.1002/mren.200900048. Demulsifying water-in-oil emulsions by ethyl cellulose demulsifiers studied using focused beam reflectance measurement, Zhuqi Chen, Junxia Peng, Lingling Ge, Zhenghe Xu, 2015. Process Analytical Technology (PAT) is changing the way R&D, scale-up, and manufacturing are performed. PAT transforms productivity, improves safety, and provides measurements for rapid troubleshooting. Process Analytical Technology (PAT) applications range from monitoring chemical reactions, crystallization, formulations, and bioprocessing.